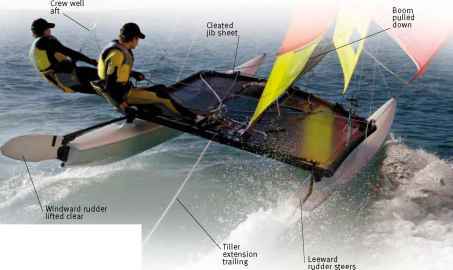 Small "beach cats," such as the Hobie 16 featured in this section, require slightly different techniques from sailing a dinghy. While all the principles of wind, balance, and trim are the same, "Go for speed!" is always the golden rule for catamaran sailors. 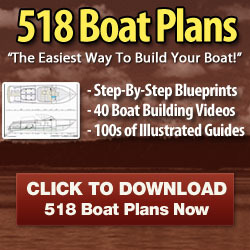 Look at the photographs on this page, and it will become clear why catamarans can sail so fast. Both crews are flying the windward hull, with just the leeward hull in the water. That super-slim hull has much less wetted surface area than any dinghy, which means there is far less drag. In addition, each of these catamarans has a beam of 8 ft (2.43 m), which is wider than any conventional dinghy hull (although not as wide as some high performance dinghies fitted with wings or racks). The beam of a catamaran gives a crew with twin trapezes a huge amount of leverage, which allows them to sail with a bigger rig than a similar length monohull. This Hurricane 5.9 is beating upwind. It will not point as high as a dinghy but will sail a lot faster. Here the crew hit full speed sailing to windward. stick to the water, and can be frustrating to sail. In stronger winds, the speed of a catamaran can make it difficult to control, with a spectacular cartwheel capsize known as "pitchpoling" likely to catch less experienced sailors. Hoist sails with the catamaran head to wind. The rigging procedure of individual makes of catamaran vary. Catamaran novices are advised to familiarize themselves with the manual and, ideally to practice rigging with someone experienced with this type of boat. 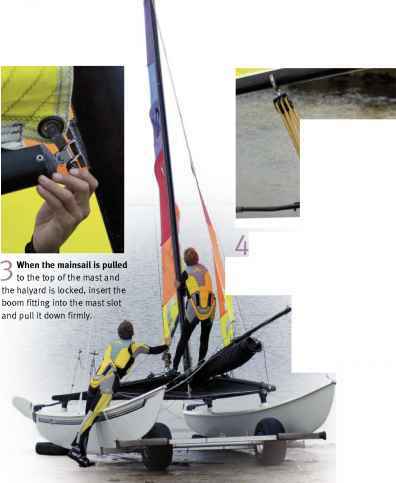 The steps below indicate some of the key stages of rigging a Hobie 16. Most catamarans have full-length battens in the mainsail, which create rigidity at speed; the jib may also have battens to help stabilize the sail. Loads on the sails are extremely high, Most have a halyard lock at the top of the mast, which is designed to stop the halyard from stretching. to the forestay with plastic "hanks." Other catamarans have a full-length zipper up the jib luff. 2 The mainsail headboard withstands heavy loads. The bolt rope fits into a slot in the mast, and a double purchase on the halyard makes it easier to hoist. Rig the multi-purchase mainsheet, which controls the mainsail. It is combined with a traveler control that allows the mainsheet to slide across the width of both hulls. 5 Pull down the luff of the mainsail tightly. The downhaul controls the distribution of power in the sail.